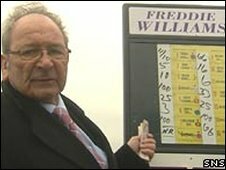 A race at Cheltenham's National Hunt Festival is to be named in honour of popular bookmaker 'Fearless' Freddie Williams who died in 2008. The Freddie Williams Festival Plate will offer £90,000 in prize money. It will be run as the fifth race on Thursday 12 March. The festival runs from 10 to 13 March. Julie Williams, Freddie's daughter, said: "This is a special honour for a very special man and the whole family is touched by Cheltenham's gesture." Cheltenham's Managing Director Edward Gillespie said: "Freddie was one of the people who helped define the Festival in modern times. "His friendly battle with JP McManus was the highlight of the betting ring action each year and he certainly earned his nickname 'Fearless' by being prepared to back his own opinion against those of people with bulging pockets. "The Festival will be a poorer place without him this year and we are delighted to be renaming the Festival Plate in his honour." Julie Williams, who will be standing in the betting ring in her own right for the first time this year, added: "Dad loved the Festival and everything it stood for and this will give us some more great memories of his favourite meeting."